Home to a diverse group of General Motors vehicles, from vintage muscle to the modern 5th Generation Camaro, this is the place to be each June. Organized by year, make and model, the National Parts Depot showfield is home to a wide array of classic and modern GM products. Buckle up for autocross action, indoor displays of concepts, customs, performance and historic vehicles, industry guests, activities for the kids and special prizes throughout the weekend. You will also find an unbelievable variety of vendors, an all-GM car corral and the Manufacturers Midway vending area. Becoming an NIA member gives you access to expert tech advice, free classified advertising and the IMPALA NEWS magazine. Get started by downloading our Membership form or visit our Membership page to learn more. 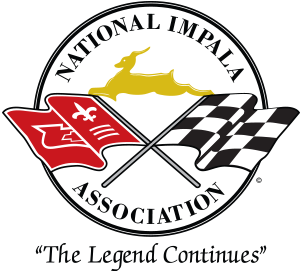 The National Impala Association (NIA) is an association of Chevrolet owners and enthusiasts. NIA features Chevrolet’s finest full-size cars built between 1958 to present, as well as Canadian Pontiacs. Copyright © 2017 National Impala Association. All Rights Reserved.